If you are missing the Victorian extracts: from the Beckley school logbook entries due to the hop-picking vacation why not buy a copy of “Diary of a Victorian Schoolmaster” or its companion book ‘Beckley C of E School, The Victorian Years.’ Available to buy at the school office or the Rose and Crown. A donation from each book sold goes towards the Beckley School Association. Messy Church: Beckley Church after school 3.30pm term time only – dates to follow for September term. Parish Council meetings: Please be aware that from August the meetings have moved to first Monday of the month….same venue same time. Next meeting September 3rd. Coffee morning with stalls, books etc: Friends of All Saints hold a monthly coffee morning on the first Tuesday of the month. The next one is 4th September 10.30 – noon. In the Village Centre. New Fitness Sessions: Jubilee field Wednesdays 6am and 10am open to all £6 per session. The sessions are open to all and are mainly for adults, but are kid friendly, so feel free to bring your kids along and they can join in or just play on the new equipment. On the subject of fitness! : Sunday September 9th see the start of the new multi terrain 30k and 15k race. Starting at 9.30am at The George in Rye and the runners will pass through quiet country lanes and through Beckley. Nice Work the race organisers are staging this event in conjunction with the Rye Runners and hope it will become an annual event. Volunteer marshalls are also needed in Beckley. The event is raising funds for the Oliver Curd Trust Charity. 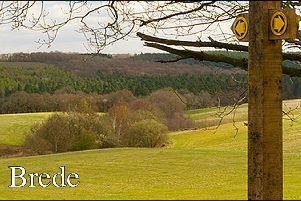 Ruunners can enter online at ryeancienttrails.com or on the day at race HQ behind the Rye Sports Centre. Village Hall Groups/Clubs: Buzzy Bees-Babies & Toddler Group – Village hall weds- term time- 9.15-11.15am £2.50 a family. Beckley Preschool- Village Hall- term time Mon 9-3 Tues 9-3 Wed 9-1 Fri 9-3- 01797 260 582- www.bpnn.co.uk. Village Primary School- 01797 260 342- www.beckley.e-sussex.sch.uk. Messy Church-Beckley Church- 3.45-5.30pm bandpmessychurch@gmail.com. All Saints Church – Fr Martin Harper -Tel: 01424 883408. www.beckleyandpeasmarshchurch.co.uk. Friends of Beckley Church-coffee morning- 1st Tuesday- 10.30-12.30-Village Hall- 01797 260360. Farmers Market – held every 2nd Saturday of the month - Village Hall- 10-12pm. Parish council -All Welcome- meet every 1st Monday - Village Hall – 7.30pm. WI – 2nd Monday 7.30pm –Village Hall-01797260450. Trefoil 3rd Monday of month –Village Hall- 01797 260537. Pilates –every Monday 6.30-7.30pm & Wednesday- 1.30-2.30- Village Hall-07769651899. Taekwondo every Wednesday-4.30pm Village Hall- Start from age 5. Petra 01233 642357. Brownies & Guides- Thursdays term time-5.45-7.15pm - Village Hall- 07967533343. Table Tennis- Every Thursday- 9.30-11.30am– Village Hall- 01797 252382. Tennis Court- Located at top of the Playing fields free to play and unlocked. Yoga- every Friday 9.30-11am –Village Hall- Romy 01424 421876. Lunch Club- All ages- 2nd Thursday-Village Hall- 12.30- 01797 260518. History Society-01797 252173. Horticultural Society- 01797 260232. Beckley Players (Am/Dram)- 01797 260898. Beckley Bowls- 01797 252129. Beckley Cricket Club- 07599175491. Beckley Rangers-football- 01797 260513. Village Hall Hire- 01797260846 hirebeckleyvillagecentre@hotmail.com.